Caribbean travel evokes images of turquoise blue water, lazy afternoons reading a steamy novel while reclining in a hammock, and evenings of romantic candlelit dinners under the stars. The Caribbean Sea spans from just south of Florida all the way to the coast of South American and west to the Yucatan Peninsula of Mexico. Named for the Caribe Indians who once populated the region, the Caribbean consists of over 7000 islands, atolls, and cays, most of them uninhabited. The Caribbean islands were favorite pawns in the 19th century European imperialist land-grab and most of the islands reflect the British, French, Spanish, or Dutch customs and language of their (largely) former European affiliations. Pirates, too, found the islands attractive and many infamous pirates, such as Captain Morgan, made the islands their home. Today, the Caribbean is a peaceful, sunny, relaxed playground, filled with white sand beaches, delicious West Indian Creole cuisine, and hundreds of resorts, from charming bed and breakfast inns to large, sprawling mega resorts. There are also a variety of cruises available in both the Western Caribbean and Eastern Caribbean. Caribbean travel can be almost anything you'd like it to be. Golfers will delight in the scenic championship courses, such as the Dorado Beach Resort course in Puerto Rico or the hilltop Mahogany Run course on the island of St. Thomas. Beach lovers don't have far to look in the Caribbean. Some of the best beaches in the world, such as Seven-mile beach in Grand Cayman, and St. Thomas' Magens Bay Beach, are located here. The food is spicy and delicious, and makes good use of the lush local produce and freshly caught fish and seafood. Particularly good are dishes made with conch and spiny lobsters caught right in the Caribbean Sea. The Caribbean has its historical sites, too. Former sugar plantations dot many of the islands, some converted into interesting restaurants or hostelries. 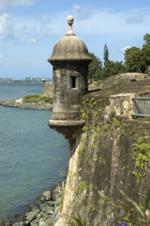 The Spanish outpost at San Juan is the oldest in the New World and visitors can walk through the picturesque "Old San Juan" as well as tour El Morro Castle there. Watersports are plentiful in the islands. Windsurfing, waterskiing as well as snorkeling and scuba diving are offered on most islands. Sports fishing is another major attraction, as the warm Caribbean waters draw a wide variety of fish, such as tarpon, swordfish, and tuna. Several Caribbean islands, such as Puerto Rico, Aruba, and St. Maarten offer casino gambling and facilities range from small European-style casino to lavish palaces that rival anything Las Vegas can offer. Most islands of the Caribbean are just a two to three hour flight away from the Midwest or Northeastern United States. Many islands have airports capable of handling jets and smaller airports may be reached via smaller connecting service. The major Caribbean hub is located at San Juan, Puerto Rico. Visitors to most islands in the Caribbean must carry a valid passport. Accommodations vary from lavish, beachfront resorts to quiet, secluded bed and breakfast inns. Villas and condominiums are also plentiful and are ideal for families and those staying longer than a couple of days. All-inclusive resorts are another popular Caribbean travel option and can offer a good value, particularly to guests wanting to try a variety of activities during their stay.